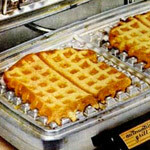 This recipe for Waffles was submitted by Britney on 9/10/2006. Click here to view the recipe. I'm only giving this 4 golden eggs because I added everything that Miss Emma suggested for my first go at this recipe. I think that without those additions, it would have been bland. As it was, my four sons ate them up. Wish I had read the reviews before making these. I added an extra 1/2 cup applesauce plus enough milk to get the batter to a good consistency. They were, however, tasty. This recipe has been carelessly written. If you want these to be the best, add the following to the recipe above: 2 cups buttermilk, 1 teaspoon soda, 1 1/2 teaspoon baking powder, 1/2 teaspoon salt and 1 teaspoon vanilla. I think you find these to be delicious. We added some chocolate chips to some with great results. READ THE COMMENTS. 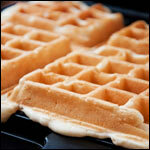 I added milk until the batter had the consistency I usually see for waffle batter. They turned out okay... just okay. 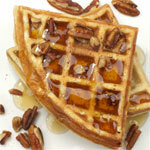 Your recipe called 'Best Waffles Ever' was a thousand times better. Add the milk and baking soda like suggested above and they are really good! I served them a party and have given the recipe to over 30 people! Seriously, they aren't bad if you just add the milk. I also wish I had read the reviews before making. I did add some milk but I not quite enough. Thanks Tanner for your help. This recipe is a flop without your advice ("add at least a cup of milk and a teaspoon of baking powder"). You need to add at least a cup of milk and a teaspoon of baking powder. With that, this recipe is great. Without it, it won't work. Mr. Breakfast please adjust this recipe. Looks like baking powder and salt were left out. Try 2tsp baking powder and 1/2tsp salt. This recipe doesn't work... it's too dry and it came out looking like dough for pizza waffle batter. I'm with you cracg, I was about to come on here and say pretty much the exact same thing! Even syrup didn't make these things soft! These were the densest waffles I've ever had. Not the greatest; would not make them again. I started this recipe and then realized it makes no sense. I added milk (about a cup) because the batter was ridiculously thick. I also added 2 Tbsp of canola oil. I was skeptical about the lack of baking soda, but they did work okay, probably because of the whipped egg whites. The recipe also needs about 1/2 tsp of salt. With those modifications they are pretty good, but not outstanding. I don't even know why you keep this recipe on your web site. I made the mistake of not reading the comments. I have now learned from my mistake. I added 1 1/2 cups of milk and 1 tsp of baking soda to this recipe, they turned out awesome! I agree, w/o all the ingredients listed, it would make a thick batter for sure! Hopefully other will read before start this recipe! Good Luck! I just wasted my time with this recipe. I made it like the recipe said and because the batter was so thick when I was done folding in the egg whites I added milk and they were still horrible. I'm on a fixed income and can't afford to waste food ingredients like this.... Don't make these!! Wow, this recipe is awful. I waited all week to try making it for my family on the weekend. 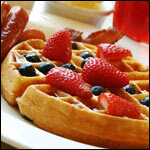 We always have a nice family breakfast Saturday or Sunday morning. I was so disappointed with this, I had to take my family out for breakfast. Like the others say, would be nice if all the ingredients were listed. It was like cookie dough before I added the egg yolks, and there was no way of folding them in either!!! This recipe is pretty good if you just add milk at the end to thin the batter. Is this recipe a joke? First of all I think the recipe creator forgot the milk! I had to add milk... looks like other liquid was left off. 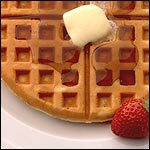 And as with any waffle recipe, the butter works better when melted. I adjusted the milk to make the batter a consistency that was good for pouring, 1/2 cup minimum. Probably be good with apples added to it also... maybe caramel instead of maple syrup - Or spiced apples on top - Very good with the addition of liquid... rotten without! I had to add about a 1/2 cup of milk, and it worked better with the butter melted. I had to add milk to this recipe. Batter was too thick for it to work without it. Once I added the milk, it worked much better. Is there a liquid missing? Batter was very dry... hard to pour.